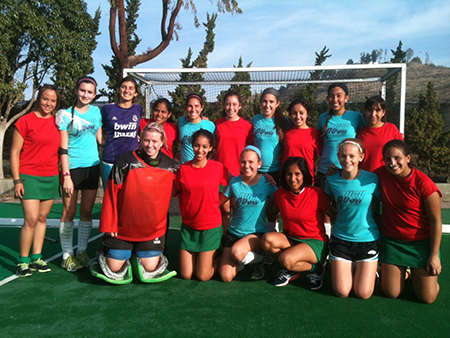 The first weekend of January 2014 marked the debut of a newly formatted field hockey style to hit California called Hockey 5. Developed overseas to provide a faster, more exciting and challenging style of field hockey, Hockey 5 is catching on in the US. Played on a half pitch of artificial turf, bordered by wooden rebound rails, it is played with four field players and a goalie. The fast paced play requires a high skill level and stamina to compete. The 1st Annual Moorpark Hockey 5 Christmas Classic Tournament was held at the Moorpark Hockey Center with the Mexican National Under-18 Hockey 5 team featured along with the local Ventura High Performance Players and two teams from San Diego’s RUSH Field Hockey Elite Performance Group. 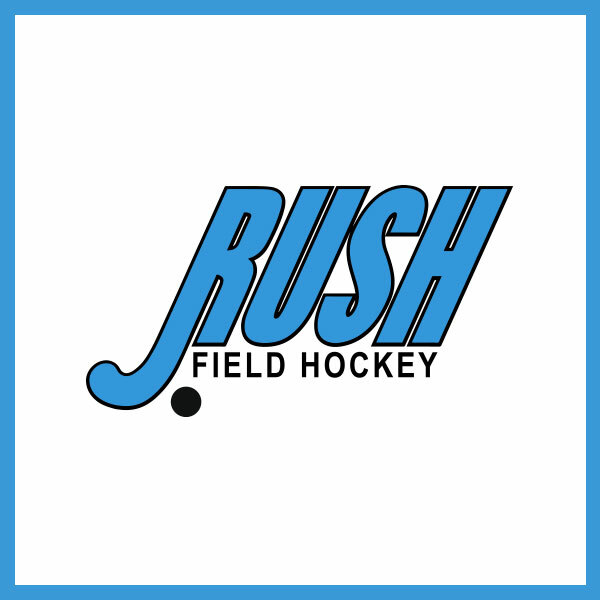 RUSH Field Hockey Elite Performance Group is composed of under-19 field hockey players. They are trained by Brian Schledorn, Director of RUSH Field Hockey San Diego. Many in the Elite Performance Group have been training with Brian, a former US National Field Hockey player, for several years. The program provides an opportunity to train in a high peer to peer level for young field hockey players focused on pursuing field hockey opportunities in college and national and international tournaments. RUSH fielded an older team of college bound seniors and a younger team of mostly sophomores and juniors. Both teams competed in the round robin tournament, playing three games daily, over a three day period. In an exciting game, the younger RUSH team held Mexico to a 1 to 1 stand off during three 15 minutes halves. In a nerve racking series of two minute sudden death overtime periods, where in each successive period, teams played with one less player on the pitch. After four overtime periods without a score, Mexico and RUSH faced each other with a single field player and a goalie. With seconds left, Mexico scored the winning goal, ending an exciting game, where RUSH literally “left it on the pitch”. The RUSH team went on to beat Ventura to finish third in the finals. The senior RUSH team faced Mexico for the championship title of the tournament. RUSH adjusted their defensive strategy, after having lost to Mexico in regular play, to shut down Mexico’s ability to score in the final round. This gave their offense the patience to find openings in Mexico’s defense and slip past their quick goalie and score five times to beat Mexico in a stunning 5 to 0 shutout. The senior RUSH team members and their verbal college commitments are: Madison Ashbrook- UC Berkeley, Torie Berkel-University of Iowa, Madison Cohen-UC Davis, Gabrielle DePetro- Cornell University, Mara Gutierrez-UC Berkeley, Ashley Watson-Stanford, Carli Wolf-St. Louis University, and goalie Grace Trupe-undecided. The sophomore and junior RUSH team members are: Tatiana Arias-2016, Farah Farjood-2016, Gabriella Jimenez-2016, Marissa Medici-2015, Danielle Puplava-2015, Nina Randolph-2016, Shannon Yogerst-2016, Samantha Zevenbergen-2015 and senior goalie Madison Belin-2014- Stanford.